We present a method, termed distributed scanning OCT (DSOCT), which reduces the effects of patient motion on corneal biometry utilizing current-generation clinically available spectral domain optical coherence tomography (SDOCT) systems. We first performed a pilot study of the power spectrum of normal patient axial eye motion based on repeated (M-mode) SDOCT. Using DSOCT to reduce the effects of patient motion, we conducted a preliminary patient study comparing the measured anterior and posterior corneal curvatures and the calculated corneal power to both corneal topography and Scheimpflug photography in normal subjects. The repeatability for the measured radius of curvature of both anterior and posterior surfaces as well as calculated corneal refractive power using DSOCT was comparable to those of both topography and Scheimpflug photography. T. Olsen, “On the calculation of power from curvature of the cornea,” Br. J. Ophthalmol. 70(2), 152–154 (1986). J. Schwiegerling, Field Guide to Visual and Ophthalmic Optics (SPIE, Bellingham, 2004). B. Seitz, A. Langenbucher, N. X. Nguyen, M. M. Kus, and M. Küchle, “Underestimation of intraocular lens power for cataract surgery after myopic photorefractive keratectomy,” Ophthalmology 106(4), 693–702 (1999). E. A. Swanson, J. 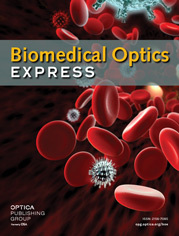 A. Izatt, M. R. Hee, D. Huang, C. P. Lin, J. S. Schuman, C. A. Puliafito, and J. G. Fujimoto, “In vivo retinal imaging by optical coherence tomography,” Opt. Lett. 18(21), 1864–1866 (1993). M. V. Sarunic, S. Asrani, and J. A. Izatt, “Imaging the ocular anterior segment with real-time, full-range Fourier-domain optical coherence tomography,” Arch. Ophthalmol. 126(4), 537–542 (2008). C. K. S. Leung, W.-M. Chan, C. Y. Ko, S. I. Chui, J. Woo, M.-K. Tsang, and R. K. K. Tse, “Visualization of anterior chamber angle dynamics using optical coherence tomography,” Ophthalmology 112(6), 980–984 (2005). K. Bizheva, N. Hutchings, L. Sorbara, A. A. Moayed, and T. Simpson, “In vivo volumetric imaging of the human corneo-scleral limbus with spectral domain OCT,” Biomed. Opt. Express 2(7), 1794–02 (2011). M. Tang, Y. Li, M. Avila, and D. Huang, “Measuring total corneal power before and after laser in situ keratomileusis with high-speed optical coherence tomography,” J. Cataract Refract. Surg. 32(11), 1843–1850 (2006). M. Zhao, A. N. Kuo, and J. A. Izatt, “3D refraction correction and extraction of clinical parameters from spectral domain optical coherence tomography of the cornea,” Opt. Express 18(9), 8923–8936 (2010). A. N. Kuo, R. P. McNabb, M. Zhao, F. Larocca, S. S. Stinnett, S. Farsiu, and J. A. Izatt, “Corneal biometry from volumetric SDOCT and comparison with existing clinical modalities,” Biomed. Opt. Express 3(6), 1279–1290 (2012). M. Tang, A. Chen, Y. Li, and D. Huang, “Corneal power measurement with Fourier-domain optical coherence tomography,” J. Cataract Refract. Surg. 36(12), 2115–2122 (2010). “Device: RTVue Cam with Corneal Power Upgrade,” (FDA, 2011), http://www.accessdata.fda.gov/cdrh_docs/pdf11/K111505.pdf . S. Ortiz, D. Siedlecki, P. Pérez-Merino, N. Chia, A. de Castro, M. Szkulmowski, M. Wojtkowski, and S. Marcos, “Corneal topography from spectral optical coherence tomography (sOCT),” Biomed. Opt. Express 2(12), 3232–3247 (2011). M. Gora, K. Karnowski, M. Szkulmowski, B. J. Kaluzny, R. Huber, A. Kowalczyk, and M. Wojtkowski, “Ultra high-speed swept source OCT imaging of the anterior segment of human eye at 200 kHz with adjustable imaging range,” Opt. Express 17(17), 14880–14894 (2009). K. Karnowski, B. J. Kaluzny, M. Szkulmowski, M. Gora, and M. Wojtkowski, “Corneal topography with high-speed swept source OCT in clinical examination,” Biomed. Opt. Express 2(9), 2709–2720 (2011). M. D. Robinson, S. J. Chiu, C. A. Toth, J. Izatt, J. Y. Lo, and S. Farsiu, “Novel applications of super-resolution in medical imaging,” in Super-Resolution Imaging, P. Milanfar, ed. (CRC Press, 2010), pp. 383–412. F. Ratliff and L. A. Riggs, “Involuntary motions of the eye during monocular fixation,” J. Exp. Psychol. 40(6), 687–701 (1950). R. W. Ditchburn and B. L. Ginsborg, “Involuntary eye movements during fixation,” J. Physiol. 119(1), 1–17 (1953). J. Otero-Millan, X. G. Troncoso, S. L. Macknik, I. Serrano-Pedraza, and S. Martinez-Conde, “Saccades and microsaccades during visual fixation, exploration, and search: foundations for a common saccadic generator,” J. Vis. 8(14), 21, 1–18 (2008). R. F. Spaide, H. Koizumi, and M. C. Pozonni, “Enhanced depth imaging spectral-domain optical coherence tomography,” Am. J. Ophthalmol. 146(4), 496–500 (2008). F. La Rocca, S. J. Chiu, R. P. McNabb, A. N. Kuo, J. A. Izatt, and S. Farsiu, “Robust automatic segmentation of corneal layer boundaries in SDOCT images using graph theory and dynamic programming,” Biomed. Opt. Express 2(6), 1524–1538 (2011). V. Westphal, A. Rollins, S. Radhakrishnan, and J. Izatt, “Correction of geometric and refractive image distortions in optical coherence tomography applying Fermat’s principle,” Opt. Express 10(9), 397–404 (2002). R. P. McNabb, A. N. Kuo, M. Zhao, and J. A. Izatt, “Keratometric optical coherence tomography using fast distributed scan patterns,” presented at SPIE Photonics West, San Francisco, CA, Jan. 23–28, 2010. S. Farsiu, M. Elad, and P. Milanfar, “Constrained, globally optimal, multi-frame motion estimation,” in 2005 IEEE/SP 13th Workshop on Statistical Signal Processing (IEEE, 2005), pp. 1396–1401. D. Malacara and Z. Malacara, Handbook of Optical Design (Marcel Dekker, 2004). V. A. D. P. Sicam, M. Dubbelman, and R. G. L. van der Heijde, “Spherical aberration of the anterior and posterior surfaces of the human cornea,” J. Opt. Soc. Am. A 23(3), 544–549 (2006). R. C. Lin, M. A. Shure, A. M. Rollins, J. A. Izatt, and D. Huang, “Group index of the human cornea at 1.3-μm wavelength obtained in vitro by optical coherence domain reflectometry,” Opt. Lett. 29(1), 83–85 (2004). D. A. Atchison and G. Smith, Optics of the Human Eye (Butterworth-Heinemann, 2000). N. E. Norrby, “Unfortunate discrepancies,” J. Cataract Refract. Surg. 24(4), 433–434 (1998). J. D. Ho, C. Y. Tsai, R. J. F. Tsai, L. L. Kuo, I. L. Tsai, and S. W. Liou, “Validity of the keratometric index: evaluation by the Pentacam rotating Scheimpflug camera,” J. Cataract Refract. Surg. 34(1), 137–145 (2008). J. T. Holladay, W. E. Hill, and A. Steinmueller, “Corneal power measurements using scheimpflug imaging in eyes with prior corneal refractive surgery,” J. Refract. Surg. 25(10), 862–868 (2009). L. Wang, A. M. Mahmoud, B. L. Anderson, D. D. Koch, and C. J. Roberts, “Total corneal power estimation: ray tracing method versus Gaussian optics formula,” Invest. Ophthalmol. Vis. Sci. 52(3), 1716–1722 (2011). M. Tang, L. Wang, D. D. Koch, Y. Li, and D. Huang, “Intraocular lens power calculation after previous myopic laser vision correction based on corneal power measured by Fourier-domain optical coherence tomography,” J. Cataract Refract. Surg. 38(4), 589–594 (2012). Sicam, V. A. D. P.
van der Heijde, R. G. L.
Fig. 2 (A) Distributed scan SDOCT pattern used in the study. Each point on the plot is in the correct lateral spatial location while the color of each point indicates the time at which it was taken. (B) A 10x zoom of the central region of the scan. Here the individual points can be distinguished. Note the distinctly different times at which spatially adjacent points are taken. Fig. 3 (A) The first 540 lines of data acquired from the scan pattern illustrated in Fig. 2. Each small corneal profile contained 100 lines of data from 5 different radial slices. The full distributed volume was acquired in 1.1 seconds. (B) Each acquired corneal profile consisted of 100 active lines and 10 inactive lines. Five slightly offset profiles were used to reconstruct the final corneal slice. The centers of all five profiles of a given slice were automatically registered to one another to provide axial and lateral translation information. This was done for all twenty radial slices. (C) Using the information from the middle diagram, all A-scans were automatically shifted back to their correct axial and lateral positions to reconstruct all twenty meridians. The anterior and posterior surfaces were automatically segmented for all twenty meridians. This information was used to calculate the surface curvatures. Fig. 5 (A) Single reconstructed meridian of 8.00 mm glass sphere phantom. (B) Single reconstructed meridian of 7.70 mm RGP contact.